The heritage of this legendary Parisian establishment dates back to 1771 and Calais, where Charles-Augustin Meurice set up an inn catering for British travellers who had crossed the English Channel en route to Paris. So successful was this enterprise that a second inn was opened in Paris itself in 1817, this then moving to its current location on the Rue de Rivoli in 1835. Since then it has welcomed a truly astounding number of historic celebrities, and attempting to list them all here would be impossible. Safe to say, however, that its pseudonym “The Hotel of Kings” (Hotel des Rois) is most apt. 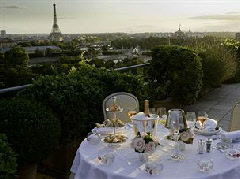 Amongst the most notable figures to have checked-in at Le Meurice are Franklin Delano Roosevelt, Queen Victoria (in 1855), the composer Tchaikovsky, King George VI, Alphonse XIII of Spain, Anthony Eden, Mata Hari, Gabriele d’Annunzio, Giorgio de Chirico, and Salvador Dali (a regular and most eccentric guest). The hotel also boasts some strong literary connections, with distinguished writers such as Rudyard Kipling, John Ruskin and Robert Louis Stevenson (1878) choosing to stay while in Paris. Furthermore, William Makepeace Thackeray eulogized about the place, recommending it to those who “don’t speak a word of French” and “like English comfort”.